Before proceeding to other polling strategies, we will look at effect of MaxTransactionSize and MaxRaiseSize parameter values in the JCA file. This post assumes the reader has the basic understanding of OSB log activity. MaxTransactionSize determines number of records to be polled in each transaction and MaxRaiseSize determines batch size i.e. the number of records to be processed in a single XML document. 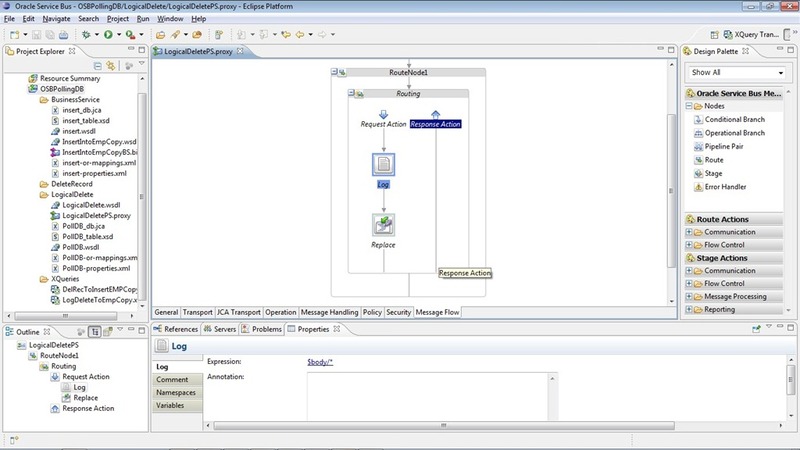 In BPEL, we can observe this behavior clearly as number of BPEL instances will be created with each instance processing the number of records as indicated by MaxRaiseSize. Since OSB is stateless no instances will be created. So we apply simple technique using OSB log activity to observe this behavior. Consider value 4 as MaxTransactionSize and 2 as MaxRaiseSize. 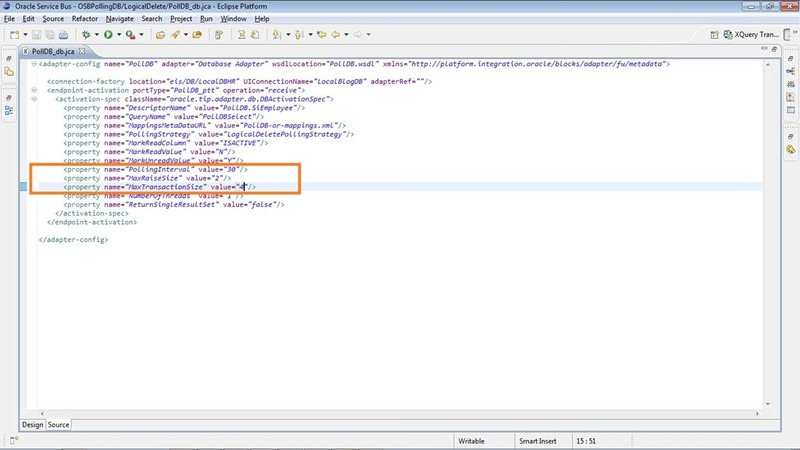 These values can be directly modified in JCA file (see above screenshot) or in the proxy service directly by unchecking option ‘Always use configuration from JCA file’. I recommend modifying JCA file as these changes would be directly used by proxy service and will not create any confusion when JCA file is further modified by DB adapter wizard at later stages during maintenance. So modify the parameter values as shown below. 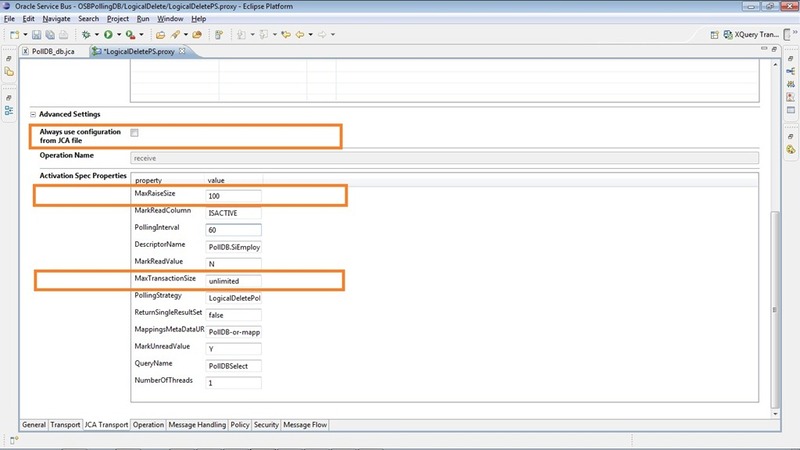 Now modify the proxy service message flow to include a log activity as shown below to log the payload before the request is routed to business service. Deploy the project and inserts 4 rows in the source table to observe the behavior from the logs. The following is the log for the AdminServer.log file stored at location <DOMAIN_HOME>\servers\AdminServer\logs. From the log it’s clearly visible that 4 records have been processed in 2 attempts by OSB consists of 2 records in each time. 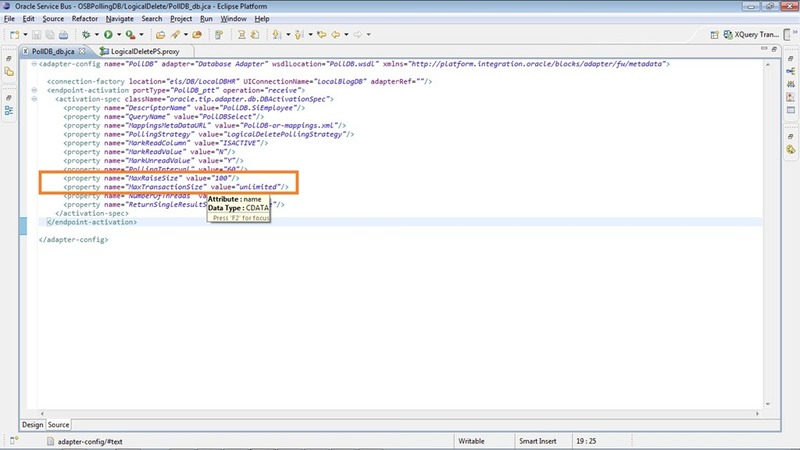 We can observe the behavior from logs by modifying MaxRaiseSize to different values like 1, 3 etc..
####<Apr 9, 2013 5:26:49 PM IST> <Info> <JCA_FRAMEWORK_AND_ADAPTER> <SVGONUGU-LAP> <AdminServer> <[ACTIVE] ExecuteThread: ’25’ for queue: ‘weblogic.kernel.Default (self-tuning)’> <<anonymous>> <BEA1-313CB0682087E97D79BE> <361a19a2fa60e1ab:7e5f3ca6:13ded702d81:-8000-0000000000006661> <1365508609710> <BEA-000000> <<oracle.tip.adapter.db.ox.TopLinkXMLProjectInitializer initialize> Initializing toplink project for use by the database adapter. If we observe the logs, all the 5 rows have been picked up rather than 4 as mentioned by MaxTransactionSize parameter. This behavior is documented in DB Adapter documentation mentioning “If distributed polling is not set, then the adapter tries to process all unprocessed rows in a single polling interval”. 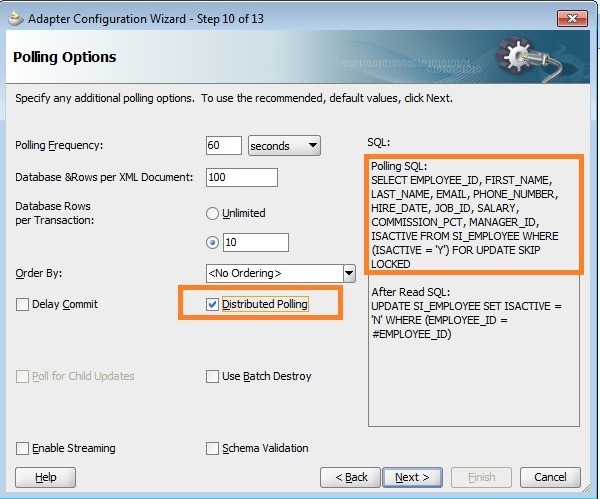 As FYI, distributed polling is an option at DB adapter level as shown below. Also observe polling SQL when distributed polling option is used. The OSB configuration jar can be downloaded from here.